PECompact is one of the most well established Windows executable compressors on the market. It compressed Win32 PE modules (i.e. EXE, DLL, SCR, OCX), including some that host .NET assemblies. Its power lies in its extensibility, allowing any number of CODEC plug-ins, API Hook Plug-ins, and Loader plug-ins. By working with anti-virus and anti-malware companies, we help avoid false alarms and deter abuse by malware authors. Many prominent software companies currently use PECompact on their products, further helping to shield our users against false alarms. Best of all, PECompact is kept up to date and fully supports Windows Vista and Windows 7 PE features. PECompact does NOT, however, yet support 64-bit PE+ modules. The primary functionality of PECompact lies in a console mode application, but a fully featured and robust GUI is also provided. PECompact has been translated into several languages. If yours is one of them, it will be presented to you upon install. LOL, the eternal mask of darkness? Really? I never noticed that comment. Software authors like to compress/protect their executables. The fact that malware authors also use the same tools as legit software developers does not makes those tools 'evil'. The eternal mask of darkness. If you will download Google Desktop, you will see its installer is compressed with PECompact. I think that sums up the following defense against the 'only used by malware' comment. My customers are NOT malware authors, they are software development companies.. from big name corporations to sole proprietorships. I try my best to deter malware abuse by working with anti-virus/anti-malware companies to help scan inside PECompact compressed executables. So, 'by something to hide', you should include intellectual property or copy protection mechanisms... NOT just malicious code. Also, CPU cycles are more abdundent than disk and network I/O in many cases. If you have a 20MB executable, its nice if only 5MB needs to be loaded from the disk or network. Well, there are always negative people.. I just want to say that with PECompact I do my best to ensure it is not abused by malware authors. Such abuse causes everyone headaches. I screen my customers, removed the free build, etc..
Are your criticisms valid? Well, sure.. The world isn't so black and white though. What may make no sense, or have no use to YOU, does make sense, or have use to someone else (other than malware authors). Only malware writers use this kinda crap. Who wants to use more CPU cycles in favor of a couple of kBytes of harddisk space ? Noone, except those trying to hide their shady code. Back when people used floppy disks this might have been useful. Nowadays, it's completely pointless. You can usually ZIP or RAR an executable smaller when packaging it up if it ISN'T precompressed. Exe compression does nothing to help the end user - it uses more RAM initially to decompress, takes longer to scan for a virus (obviously exponentially increased if you compact a lot of executables), isn't practical if you're already using NTFS compression, aids the spread of viruses as previously mentioned (if your viruskiller doesn't support a particular UPX or PECompact version, or doesn't support decompression at all, you're SOL). The cons of performing this action on exes FAR outweigh the pros. A very tasty .exe & .dll compressor. Been using it for years now, aswell as UPX (Ultimate Packer for Executables). Oh, by the way sn0wflake, viruses can not hide within compressed modules because most major anti-virus softwares support scanning inside the PECompact's modules! Great way too spred virus. Just compress the EXE file and email it to somebody :) Tried this many years ago and it worked. Note that it was on a closed LAN for testing purposes only. Just a FYI to antivirus companies. * Core: Improved support for TLS callback(s) pre-entry invocation. * Core: Resource-only DLL (no entry-point) support added. * Core: Fixed inefficiency bug where unnecessary loader code was being included anyway. Effect: Better compression of many executables. * Core: Changed behavior of section merge result characteristics. * Core: Several fixes and enhancements. * Codecs.LZMA2: New LZMA2 codec now default. Comments? It still needs tweaking, but will end up better than the old one in the end. * Docs: Updated and reformatted. 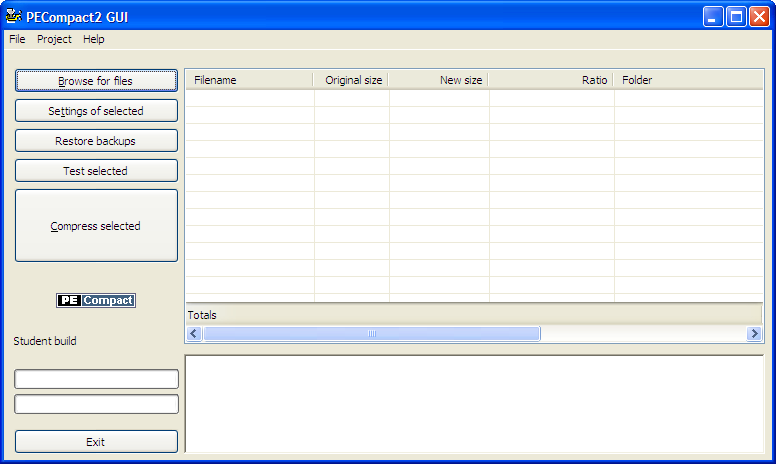 * GUI: Added new message box implementation (XMessageBox). * PE Tools: PEInsert '/DataFile:' is now implicit if filename has already been provided (i.e. *.exe mydata.dat instead of *.exe /DataFile:mydata.dat). The old parameters are still accepted as they were. * Localizers: Your native resources need to be updated with this build. You may wish to wait a few betas though. Aspack doesn't support .NET compression. I don't know what exepack is. PECompact did support .NET compression, but it is being revamped and will be re-released again in a few months. Thx for a free student version. I have (only) one remark: you can not compress .NET exe files. ExePack or Aspack can do it. The fauld is now removed. Thanks. But PECompact has allway prob. if you want compress files with "included" overlays (like TheBat!). For 'endusers' i appreshare ASPACK, it works more insensitively than PECompact. Nice from the author, that he create a student version. The version start not correct under german XP. If I start the "pec2gui.exe", you see the sand-glass briefly, this was it. Nothing otherwise happens. negate101, NSPAck is also a great competitor. Good compatibility, and higher compression ratios. Unfortunatelly it does not support the features and configurability in PECompact. I don't trust UPack to be compatible, nor does the author claim that it is. If it saves a few more bytes sometimes (see Upack page, PECompact beats it on some files), it is because it has less features and compatibility. Do you really trust Upack on your commercial programs? PECompact has been the best packer to use for some time. It keeps getting better too, which is a great plus. UPX doesn't pack many modern executables. It used to be good, but the authors are not updating it. PECompact's plug-in support is awesome too. And I read on Bitum page that this version supports .NET executables, though I haven't tried it yet.